There are some bathroom accessories in your washroom that don't receive the kind of individual attention they deserve, and your bathroom's doorway is often one of them. While many homeowners will make these accents white to keep things simple, a door provides a number of unique opportunities to create contrast and add color to the space, according to HGTV.com. If you have a door that's lacking trim, you can head to your local hardware store to give it a quick update. Invest in some small pieces of wood to form a unique border for your doorway to make it look like it's a more expensive and finished piece. Paint the pieces of wood a complementary hue to your bathroom's color scheme and then use wood glue with a hollow-core door and wood screws with a solid wood option. This will instantly give your bathroom a face lift and help it feel a lot more cozy. 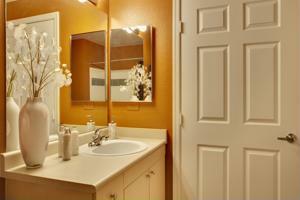 Doors may not receive special treatment in bathrooms, but there are other overlooked areas that could be spruced up. What unconventional bathroom feature do you love to decorate?